CealTech aims to become a leading global producer of high volume, high quality graphene, ultra-fine graphite and fine graphite. 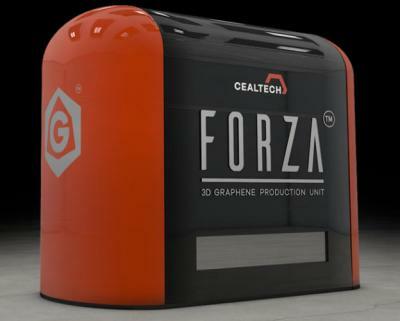 Production will be done by CealTech's independently-developed FORZA 3D graphene production unit (patent pending). The FORZA prototype unit is currently under development and should be ready for operation by October 2016. CealTech's daily single layer graphene production capabilities starting October 2016 will be 1600m2, and are planned to grow to 150,000 m2 starting 2020. The first FORZA full-scale unit is planned to start operating in 2017. This full-scale unit will have a daily graphene production volume of 10,000 m2 single layer pure graphene. Several full-scale production units will be set up in parallel. CealTech works with leading companies globally to implement its unique graphene in various products. Among the major market segments of interest are: defense, automotive, space & aerospace, energy storage, electronics and sensors, solar energy, medicine, maritime, oil & gas. CealTech is also working on developing graphene-enhanced batteries, in cooperation with a client in the automotive industry. The company estimates a 10-20 times improvement in charging capacity compared to the same battery weight and volume, with a full-charge possible in several minutes. The battery's design will be stable and retain performance over years of use. First prototype cell is planned to be ready early next year. Suitable areas for the new CealTech batteries will be varied, but one of the most attractive markets will probably be heavy power consumers like trucks and buses, ferries, aircraft, long-range cars and more.